The Pennsylvania Department of Transportation is tapping the collective wisdom and creativity of its employees through an online suggestion box. IdeaLink gives all staff members the opportunity to suggest ways to improve efficiency and safety at the workplace and on the state’s highways. And those ideas go straight to the top. Transportation Secretary Barry Schoch reviews each submission personally after it undergoes a thorough evaluation by subject matter experts. The program, launched in August 2011, is part of the department’s Next Generation initiative to modernize its processes and technologies. Not only does it give employees a direct link to the secretary, it provides Pennsylvania DOT leadership with input from staff at all levels on how the agency could operate more effectively and efficiently. "We’re breaking down barriers to implement new ideas," said Scott Christie, deputy secretary for highway administration. "It has energized the department. Employees now know that their ideas won’t be stuck in a file drawer." More than 1,000 recommendations have been submitted so far. Of the 480 Schoch has reviewed, more than 350 have been implemented. Ideas include ways to improve customer relations, boost safety, use resources—money and personnel—more efficiently, and enhance department procedures. One employee recommended putting installation dates on overhead highway signs. Designed to reflect vehicle headlights, the signs lose reflectivity over time, making them harder for drivers to see at night. The Pennsylvania DOT uses the Federal Highway Administration’s 12-year replacement cycle for signs, but in the past the only way to find installation dates was to research state route project documents. Now the agency applies date stamps to the bottom left corner of signs at minimal cost and benefits from more efficient management of the sign program. Two employees submitted similar suggestions to replace driver’s license forms that contain duplicate information. A working group, including the two employees, was formed to come up with a solution. The group recommended consolidating four forms into one: the non-commercial driver’s license, photo identification and learner’s permit application. The form lessens confusion for customers and agency employees, eliminates redundancy and saves about $14,000 a year. Because of an employee suggestion, a work zone safety video will become part of the driver’s education curriculum at Pennsylvania schools. A safety idea came from an employee who suggested installing inflation stations at rest stops where drivers could check the air pressure in their tires. A pilot may be implemented and if it’s successful, inflation stations will be installed around the state. Statistics indicate that improperly inflated tires contributed to about 35 percent of crashes in Pennsylvania in 2010. Properly inflated tires also improve fuel efficiency. Another safety suggestion stemmed from an employee’s concern about workers in construction zones, especially their exposure to dangers posed by distracted driving. As a result, the Bureau of Driver Licensing, the Bureau of Maintenance and Operations and the Press Office are creating a work zone safety video that will become part of the driver’s education curriculum in schools across the state. 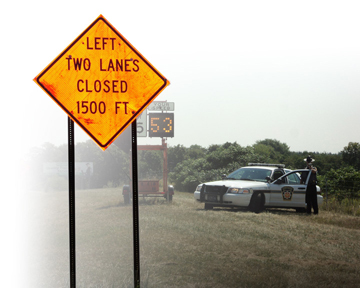 The video will reinforce the message of work zone safety to prevent crashes and fatalities. The agency spreads the word about the program through posters in its offices and facilities and articles in the employee newsletter on ideas that have been implemented and how to submit new ones. "The secretary also communicates with employees via e-mail on the status of the IdeaLink program and thanks employees for their invaluable contributions to make the agency operate more efficiently," said Jamie Legenos, Pennsylvania DOT information specialist. At a recent awards ceremony, Schoch recognized several employees for their IdeaLink suggestions. The employees were chosen for awards based on the creativity, return on investment, overall significance and implementation of their ideas. Other state agencies plan to model the program, including the Pennsylvania Department of Environmental Protection, the Pennsylvania Liquor Control Board and the Office of Administration, said Legenos. Even private companies, such as Michael Baker, Jr., Inc., are looking at the concept as a way to engage employees. A series of fall summits gave more than 1,000 professionals at the front lines of highway project delivery the opportunity to mull over the latest round of Every Day Counts innovations to shorten project delivery. Strategies for locally administered Federal-Aid projects are designed to help local public agencies navigate the complexities of the Federal-Aid Highway Program. Three-dimensional modeling technology allows for faster, more accurate and more efficient planning and construction. Intelligent compaction uses special vibratory rollers and GPS technology to improve the quality, uniformity and performance of pavements. The use of alternative technical concepts enables contractors to propose innovative options on projects that are equal to or better than the state’s criteria. Other strategies are continued from the first round of Every Day Counts that began in 2010, including programmatic agreements, design-build and construction manager-general contractor project delivery methods, and accelerated bridge construction techniques. Sessions also covered environmental provisions of the new Moving Ahead for Progress in the 21st Century Act. Some innovations in the second round of Every Day Counts—including high-friction surface treatments, geometric intersection and interchange designs, and geospatial data collaboration—will be covered in a series of virtual summits in spring 2013. At the fall summits, FHWA sought feedback from participants on proposed strategies to implement the Every Day Counts innovations so the expert teams the agency has formed to spearhead deployment could adapt their strategies to state needs. Participants also met in state caucuses to come up with preliminary recommendations on which innovations to incorporate into their highway programs over the next two years. They took those suggestions back to their state agency colleagues to develop their own plans. The state-based approach is at the heart of Every Day Counts, FHWA Administrator Victor Mendez told summit participants in Baltimore, Md. "This is about tailoring Every Day Counts to the needs, laws and regulations of each state," he said. The summits are an important part of the process because they foster ownership of the goal to improve project delivery, Mendez said, but the ultimate goal goes beyond deploying new technologies. 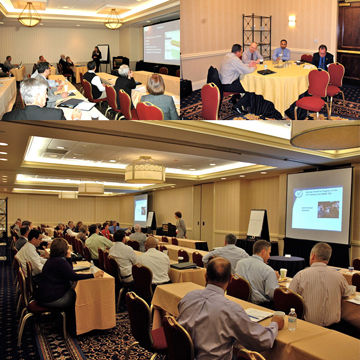 Representatives of highway agencies in the Mid-Atlantic states convened in Baltimore to learn about Every Day Counts strategies to shorten project delivery. "We have a much more ambitious goal, which is to change the culture of the transportation community to one that embraces innovation as the standard way of doing business," he said. "We’ve committed ourselves to a course that will benefit the American taxpayer. Every Day Counts is about fulfilling our mission in a better, smarter, faster way." One is the Safety EdgeSM, a paving technique that tapers the roadway edge to allow drivers who drift off highways to return safely. Since October 2010, more than 40 states have used the technique on more than 774 projects. The Virginia Department of Transportation has completed two pilot projects and developed a draft specification, said Dr. Jose Gomez, director of the Virginia Center for Transportation Innovation and Research. Forty-five states now have specifications or contractual language that allows the use of warm-mix asphalt, which can be produced and placed on the road at lower temperatures than conventional hot-mix asphalt, reducing fuel use and extending the paving season. The Delaware Department of Transportation plans to use it on all asphalt paving jobs by 2015, Rusty Lee, director of the Delaware Local Technical Assistance Program, reported at the Baltimore summit. Eighty-five bridges have been built using the geosynthetic reinforced soil integrated bridge system. GRS-IBS technology not only accelerates bridge construction, it can lower costs and improve durability. Forty-four transportation agencies are in various stages of implementing adaptive signal control technology at 64 locations. This technology automatically adjusts when green lights start and end, promoting smooth traffic flow and easing congestion. In West Virginia, a system was installed in Morgantown to ease congestion in the West Virginia University area, said Marvin Murphy, state highway engineer. Prefabricated bridge elements and systems—which reduce onsite construction time, minimize traffic disruption and improve work zone safety—have been used on 675 bridges. Thirty-eight states have at least two active programmatic agreements, which establish streamlined approaches to handling environmental requirements on projects. A total of 103 agreements have been updated and 55 have been initiated under Every Day Counts. The District Department of Transportation uses them on 50 projects a year, said Ronaldo Nicholson, the agency’s chief engineer. Twenty-six states have active agreements for stream and wetland mitigation banking programs, which provide an efficient way to minimize resource requirements and expedite project delivery. Design-build contracting, an accelerated project delivery method that combines the design and construction phases in one contract, has been used on 196 projects. The North Carolina Department of Transportation used it to replace seven bridges in 74 days on Ocracoke Island, said Debbie Barbour, the agency’s director of preconstruction. Twenty projects have used the construction manager-general contractor process over the past three years, and 25 projects are planned over the next two years. CM-GC accelerates project delivery by involving the contractor early in the project. The Federal Highway Administration used a collaborative process to select the initiatives that make up the second round of Every Day Counts. As FHWA works with state agencies to implement the second round of initiatives, it will continue to monitor deployment of the first-round innovations and measure them for long-term effectiveness, Nadeau said. "We’ll build on those achievements in our round two initiatives to continue creating a culture of innovation," he said. For more information on Every Day Counts, go to www.fhwa.dot.gov/innovation/everydaycounts. To view a summit video, visit www.youtube.com/watch?v=Is_21-8rTEg&feature=youtu.be or scan the QR code with your mobile device. By all indications, the New York State Department of Transportation has scored a singular success with its new diverging diamond interchange in suburban Rochester. It’s already reducing traffic congestion and improving driver safety at the intersection of Interstate 590 and Winton Road in Monroe County. As well, the DDI design reduced construction costs and slashed delivery time from three construction seasons to just two. The DDI enhances and simplifies the operation of the intersection at a diamond-style interchange by removing from the signalized intersection the turns on to and off of the ramps. This is accomplished by moving traffic to the left side of the roadway between the ramp terminals. The DDI design reduces the number of perpendicular conflict points compared to an equivalent conventional diamond layout. The DDI is one of the Federal Highway Administration’s Every Day Counts innovations, and the New York project received a grant from the agency’s Highways for LIFE program to use it. 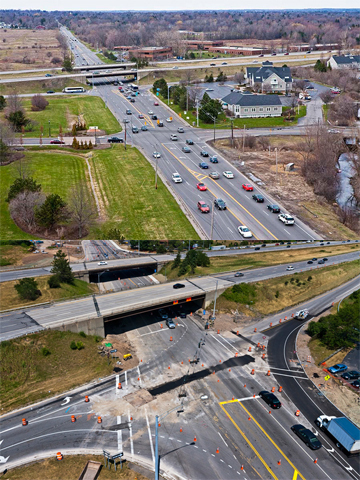 Thanks to an intensive public outreach program headed up by Lori Maher, New York State DOT public information officer for the Rochester region, the new DDI, opened to drivers in September 2012, has met with widespread understanding and acceptance by the public. "In order for people to understand this concept and accept it, we had a lot of education to do," said Maher. The community outreach program began early, in 2008, at the beginning of the design stage of the project. "The project team held meetings with individual stakeholder groups in the area, including neighborhood groups, some of the nearby business office complexes, the elected officials, emergency services providers, bicycle groups and people like that," said Maher. "We explained this one unique alternative under consideration. We developed a traffic model and visualization. Our consultant, Fisher Associates of Rochester, was able to create a computer-generated traffic modeling and visualization tool that had the feel of a video game. It illustrated how people would drive the interchange from the driver’s seat. That was very helpful because it’s hard to explain on paper or with a PowerPoint presentation." Maher said public comments confirmed the problems the project team had found with the old interchange. "Once we heard that the problems were left-turn conflicts and traffic backups to get on the expressway at night and backups getting off the expressway in the morning, we said, ‘OK, we think that too,’" said Maher. A project website, as well as a project brochure, a public information meeting and two full-length narrated videos, helped with public education during the construction stage (see www.dot.ny.gov/590winton). "We actually developed animations with a narrated voice to explain how to use the DDI," said Maher. "And we put that on the website and made DVDs available. We sent them to driver’s education classes and we distributed them in the community. We even put them up on YouTube." Feedback has been positive from drivers trying New York’s new diverging diamond interchange in suburban Rochester. The old interchange generated complaints about traffic backups and left-turn conflicts. Local news media played an important role in public education. Video clips were available on the project website that could be downloaded and used by electronic media. On opening day, drivers did well with the new interchange. "On September 11, people came to work on their morning commute and they approached the new interchange," said Maher. "It was all over the news the day before that. And there had been a lot of media coverage during the project, so people were not too surprised. And then we had a lot of media coverage during opening day. "People are driving through it just fine," said Maher. "We’ve gotten good verbal feedback from people. Already we’re seeing traffic that used to back up on Winton Road northbound, for example, way back. Now they’re just proceeding right up to the expressway interchange and accessing the highway. I’m sure that as lane closures finish up, we’ll see improvements in traffic flow." Safety will improve as well, said Maher, because left-turn conflicts with oncoming traffic are eliminated. "Now left-turning traffic doesn’t have to wait for a green arrow, or wait for the gaps in oncoming traffic and worry about misjudging traffic," she said. "We were able to eliminate left-turn conflicts altogether in this design." Maher said the New York State DOT will consider the diverging diamond design where applicable for future interchanges. "It’s a low-cost solution, it often helps preserve the infrastructure that is already there, and it doesn’t require a lot of right-of-way," she said. "So we don’t take land that we don’t need to, and it really provides the capacity for what we’ll need well into the future." A report on the innovations used and lessons learned on the New York Highways for LIFE project is available at www.fhwa.dot.gov/hfl/projects. It encourages the use of innovative technologies and practices and enhances contracting efficiencies. It targets the environmental review process, providing for earlier coordination, greater linkage between planning and environmental review, use of a programmatic approach when possible and consolidation of environmental documents. States with projects stalled in the environmental review process can get technical assistance from the Federal Highway Administration to speed completion. It strives to improve project delivery efficiency by broadening states’ ability to acquire or preserve right-of-way for a transportation facility before completion of the review process required under the National Environmental Policy Act. MAP-21 mainstreams innovations promoted by Every Day Counts, such as planning and environmental linkages to minimize duplication of effort and foster more informed decisions, time-saving programmatic agreements, and use of the construction manager–general contractor project delivery method to encourage innovation and optimize construction schedules. It also calls for a new initiative patterned on the Highways for LIFE pilot program to provide incentive funding for deploying strategic innovations. The Arkansas State Highway and Transportation Department is using a Highways for LIFE grant from the Federal Highway Administration to investigate innovative roller-compacted concrete on a rehabilitation project. Since 2007, natural gas exploration in the north central region of Arkansas has led to the rapid development of more than 4,000 gas wells. Because each well requires more than 1,000 truck trips, public roads in the region have been subjected to a tremendous number of heavy traffic loadings for which they were not designed. The result has been a distinct acceleration of pavement deterioration. The Arkansas agency will place an overlay of roller-compacted concrete on a 2-mile (3.2 kilometer) section of Highway 213 in Conway County worn out by heavy truck traffic. RCC pavements are zero-slump (damp) concrete mixtures that are paved using a technique similar to that of hot-mix asphalt. RCC is made with the same components as conventional concrete pavements: water, cementitious materials, crushed aggregate and sand. But RCC is a much drier mixture than conventional concrete and resembles damp aggregate. 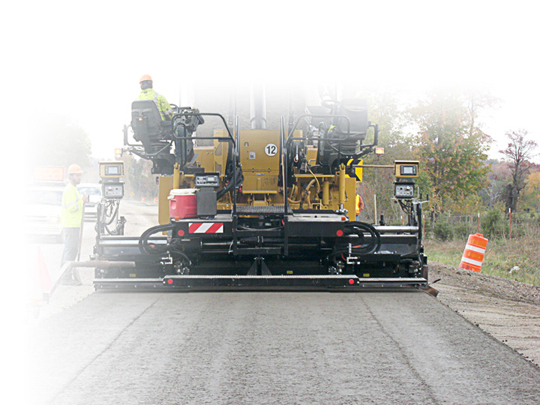 After mixing, the RCC is placed using an asphalt paver and compacted using steel-wheeled vibratory rollers. RCC is constructed without forms, joints or steel reinforcement and does not require finishing. The purpose of exploring the use of RCC pavement on a low-volume highway that has experienced accelerated pavement loadings is to examine the pavement’s durability under heavy loading conditions, as well as its cost-effectiveness. "I think in the long run this type of pavement is stronger under heavy truck loadings than a conventional asphalt overlay," said Gary Buzbee, Arkansas state resident engineer on the Highway 213 project. "This is considerably stronger, but obviously it is considerably more expensive than an asphalt overlay." On half of the $1.7 million Highway 213 project, the existing asphalt will receive a leveling course, then an 8-inch (203-millimeter) overlay of RCC. The road will be widened on each side to provide an 11-foot (3.5-meter) lane width with 3-foot (0.9-meter) shoulders and a Safety EdgeSM, a tapered edge that makes it easier for cars that run off the road to return to the pavement. The Safety Edge is one of FHWA’s Every Day Counts technologies. For the second half of the project, the existing asphalt will be pulverized, mixed with cement for stabilization, compacted and overlaid with 7 inches (178 millimeters) of RCC. "The biggest benefit of roller-compacted concrete is that you get a lot of structure with a quick construction process," said Dr. Stacy G. Williams, research associate professor and director of the Center for Training Transportation Professionals at the University of Arkansas. Williams, who is using the project to research the feasibility of RCC, said RCC takes just two days to cure, compared to seven days for conventional concrete pavement. "We’re getting lots of truck traffic that these little two-lane roads were not designed for," said Williams, adding that rutting asphalt has been a problem under the truck traffic. "With RCC, we’re getting a lot of additional structure, and concrete won’t rut." An Arkansas project is testing the feasibility of using roller-compacted concrete to rehabilitate a road with heavy truck traffic. RCC is not a construction method used traditionally for rural highways in the United States, although recently it is seeing increased use for highways. Because there are no load transfer dowels, steel reinforcing, forms, joints or finishing, RCC is simpler and faster to build than conventional concrete pavement. RCC has a low cement content, which reduces its cost compared to conventional concrete. "From a construction standpoint, RCC is a lot quicker than conventional concrete. Once you get it placed you can put light traffic on it in 24 hours. Then we will take cores, and if we can get a 2,500 psi break on some of the cores, we can put heavier traffic on it," said Buzbee. "We’re trying to determine how feasible RCC is from a cost-benefit standpoint. You can throw plenty of money at anything and get a very indestructible product, but we don’t have unlimited funds. If we do more of this RCC in the future it will be because it has a favorable cost-to-benefit ratio." New technologies and processes are helping highway agencies improve the way they build and operate the nation’s highway infrastructure. The Colorado Department of Transportation used the slide-in method when it replaced a bridge on U.S. 34 over the North Fork of the Republican River northeast of Denver. The new bridge superstructure with deck was built parallel to the old, structurally deficient timber bridge during nighttime closures of the roadway. In a four-day full road closure, the old bridge was demolished, the new bridge was slid into place, and the approach work was finished before the bridge was opened to traffic. The agency has several other projects that use accelerated bridge construction techniques under contract. Bellevue, Wash., is enjoying success with adaptive signal control technology. Three years ago, Bellevue became the state’s first city to install adaptive traffic signals. Its six-year transition of about 180 intersections has a $4 million price tag. The city reports that along NE 8th Street afternoon travel times are down about 40 percent and on busy Factoria Boulevard the commute time from 5 to 6 p.m. has dropped 36 percent. The public is also noticing and commenting on the reduced delay. Seven other local agencies across the state are planning adaptive signal control systems. Using accelerated bridge construction techniques enabled the Rhode Island Department of Transportation to open the Frenchtown Brook Bridge in East Greenwich a month earlier than planned. The agency received a Highways for LIFE grant to use innovation to replace the 57-year-old bridge. The scheduled closure was for no more than 65 days, but the Rhode Island DOT demolished the old bridge, assembled the new structure using precast concrete components, and opened it to traffic in 33 days. The agency included a $3,000-per-day incentive clause in the construction contract for opening the bridge early. Traffic is now circulating on Georgia’s first diverging diamond interchange, an innovative design that improves safety and reduces congestion. The $4.7 million project featured the design on Ashford-Dunwoody Road over I-285 in Atlanta. Also part of the project are video detection systems to adjust signal timing as traffic conditions change. This is the first of three DDIs planned for the Atlanta area. To see how the Ashford-Dunwoody Road DDI operates, go to www.youtube.com/watch?v=gY8xU-UAQWs&feature=player_embedded.